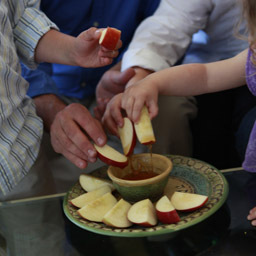 Join us for a delicious Shabbat dinner filled with stories, song, Torah learning and comradery. Hear about the American Legal System & how YOU can make it better! Friday, August 26. Shabbat Services at 7:30pm (Mincha at 7:00) followed by dinner. Please join Hadassah Greater Miami along with the University of Miami Miller School of Medicine for a Human Trafficking Panel Discussion on Tuesday, September 6, 2016 at Temple Israel Greater Miami. The discussion will feature Katherine Fernandez Rundle/State Attorney of Miami-Dade County, Dr. Katariina Rosenblatt/Survivor of Human Trafficking, Nancy Ratzan/Champions women's rights and social justice, Julie Cummings/Founder and Chair of Lovelight Foundation, Jose Szapocznik, PH.D. Department of Public Health Sciences University of Miami School of Medicine. Continental Breakfast followed by discussion. Each presenter will bring their expertise to the discussion. 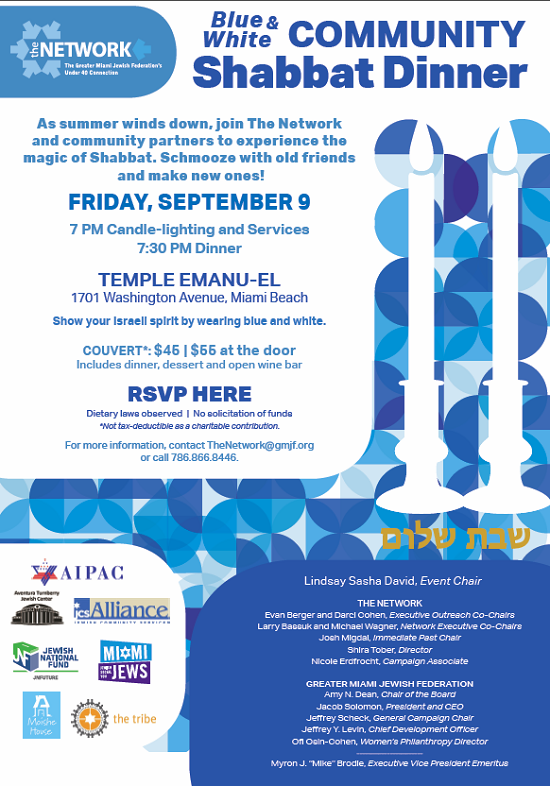 Join The Network and community partners for a magical Shabbat experience on Friday, September 9th, 2016. Register before September 1st and receive a preferred rate. Show your Israeli spirit by wearing blue and white! WIZO Presents DENNIS PRAGER on September 21st! Join WIZO Florida's Opening Campaign Dinner on Wednesday, September 21st, 7:30 pm at the Aventura Turnberry Jewish Center and hear all about "WHY IS ISRAEL ALONE IN THE WORLD" with Keynote Speaker Dennis Prager. CLICK HERE TO PURCHASE YOUR TICKETS by August 31st - Couvert $150.00 pp ($180.00 pp after that date) / Young Adults $75.00 pp ($90.00 pp after that date) or call the WIZO FL Office 305.861.8860 for further information. Celebrating Past, Present and Future WIZO Supporters. This promises to be an incredible evening! For other programs, go to www.jbstv.org for the Schedule. On Sunday, August 28, 1pm - 5pm, The Tribe will be hosting it's 2nd Annual Pool Party on the rooftop of EPIC Hotel. Admission is $18 Advanced / $25 Doors and includes a free drink, DJ entertainment, signature cocktails, and FREE VALET (if exit before 5pm). Have You Thought About Joining A Synagogue? Has it been a while since you attended services? Are you looking for a spiritual connection this Jewish New Year? There is no better way to experience the richness of these High Holidays than among a congregation of your friends and neighbors. To help you choose a place to worship, the Greater Miami Jewish Federation and the Rabbinical Association of Greater Miami have compiled this directory of area synagogues. We encourage you to select a synagogue and call for membership information. If you are new to the community or would like to learn more about local congregations, please call the Rabbinical Association of Greater Miami at 305.576.4000, ext. 620. Make the year 5777 a time for Jewish renewal for you and your family, and a time to find personal meaning and to connect with your community! WIZO Presents DENNIS PRAGER on September 21!! NORTH MIAMI BEACH, FL - Barry A. Nelson, a shareholder of Nelson & Nelson, P.A. in North Miami Beach, Florida has been recognized as a leading lawyer in the practice areas of Trusts and Estates and Tax Law in the 2017 edition of The Best Lawyers in America©. Nelson has been named in over 20 consecutive editions of Best Lawyers®. Lawyers on The Best Lawyers in America list are divided by geographic region and practice areas. They are reviewed by their peers on the basis of professional expertise, and undergo an authentication process to make sure they are in current practice and in good standing. ​Corporate Counsel magazine has called Best Lawyers "the most respected referral list of attorneys in practice."